Motocross Madness, by Microsoft Studios. 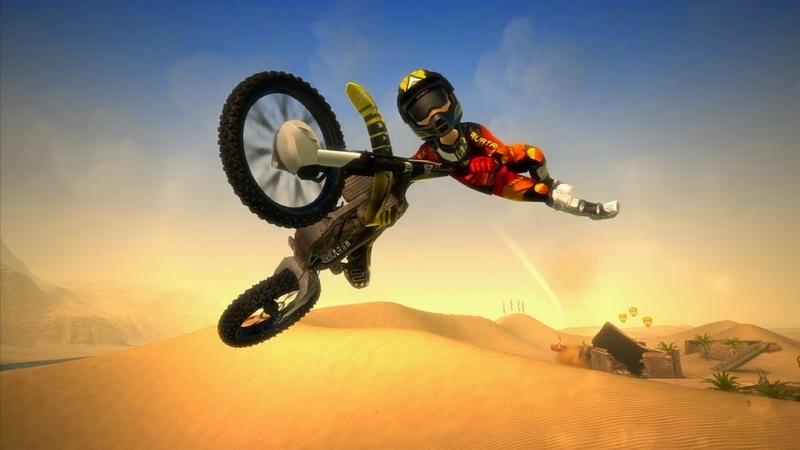 Motocross Madness is free via Xbox Live Games With Gold until August 15th, 2014. At first glance, this is a very generic racing game. 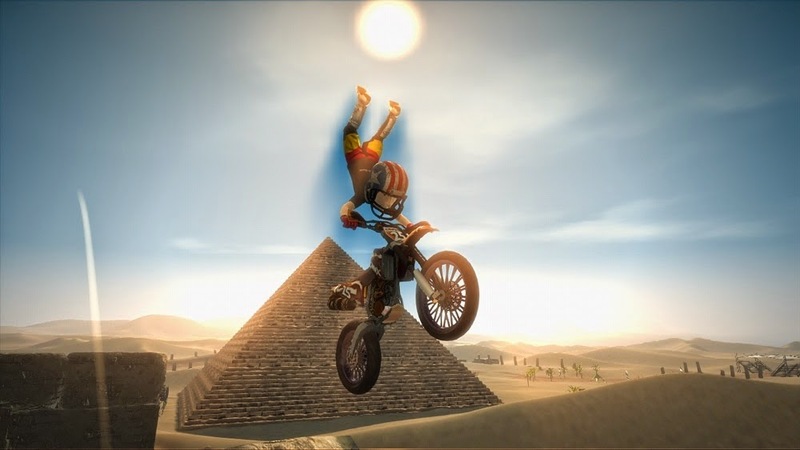 You ride a motorcycle through a track with the ability (but not the obligation) to do fancy tricks during jumps, and you can buy different bikes and upgrade them to improve your speed. However, this game does some ingenious things with the formula, creating a fun, open world atmosphere and a thrilling race experience. 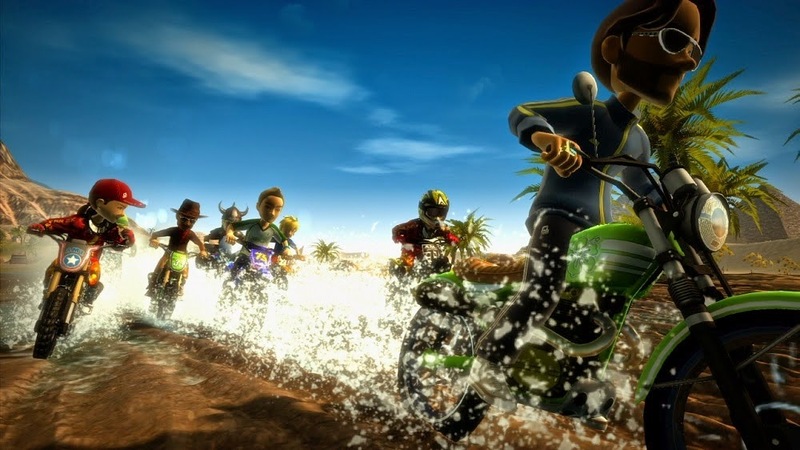 Plus, your Xbox Avatar is the rider. Who doesn't want that? For starters, the game's racing is quite exciting. It's an arcade style of racing, with a heavy emphasis on flashy drifting and fluid motion. And the tricks help make each jump memorable. The tracks, while limited in number, also are very entertaining, with numerous side paths and shortcuts to explore. And each track has coins to collect along the way, which don't contribute much to your money gain compared to medals, but it does provide a nice added challenge for the completionist gamer. And the other modes help the game shine even more. There's an trick mode where you're in an open world, comprised of a region with 3 race tracks, where you find jumps to do tricks and get a certain medal score. And in that same open world, there's an exploration mode that lets you collect skulls and coins to medal with no time limit. It essentially creates a game mode that's puzzle platforming on a motocycle, which is a very unique concept to me. The bike upgrades and clothing upgrades did little to excite me, but it did provide a nice progression early in the game. However, the starting bike, when fully upgraded, is good enough that I had little to no motivation to buy the other bikes. I thought that was a missed opportunity, allowing the player the upgrade his starter all the way to "S" class. However, as I said, I didn't really feel like it was a necessary part of the game anyway. The racing is fun and I like the arcade style. It's similar to Mario Kart, which tricks and flash replacing items, but it still has some of the more realistic racing charm, like understeering and a MPH counter. But I would have probably put the game away already if not for the exploration portion. That mode allows for hours and hours of fun, especially given that it's not time based. And the skulls you pick up are well spread out between "find it and it's easy to get" to "easy to find but requires a lot of skill to get". I did get discouraged early on, but once my bike had a round of upgrades the exploration was tremendous fun. The multiplayer functionality is fun, and you can do exploration together, even locally, but as I just mentioned, it's best to upgrade the bikes first before you gallivant around the exploration areas. I'd say this game is definitely fun for racing fans, and if you don't like the racing portion, just do a few races, upgrade your bike a bit, then spend some time in Exploration. It's definitely worth a try. Let me know what you think of Motocross Madness!